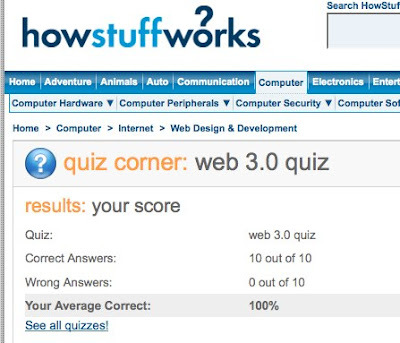 My score on the HowStuffWorks Web 3.0 quiz. One of the questions had three wrong answers, but I prevailed by selecting the most right. Well, you could always blame it on falling behind when you took that vacation without Internet access. It's your DH's fault. Well I could -- and always good to blame on hubby. Be to be honest got myself confused over Web 3.0 because there has been debate concerning what is Web 3.0. Which was made worse by a presentation this week that I attended which said Web 3.0 was virtual worlds (which I knew it wasn't).